RoyalEnfields.com: For sale: Is this Enfield a bad penny? For sale: Is this Enfield a bad penny? 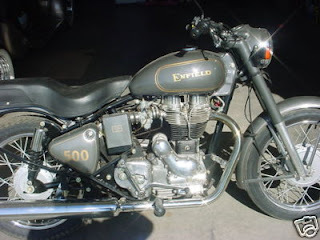 A 2003 Royal Enfield motorcycle for sale on eBay (the ad expires soon, unless it is renewed) has been for sale since at least December, 2008. That's when I first started watching this ordinary looking bike with an extraordinary history. It is a Bullet 500, on sale in Dewey, Ariz., with only 332 miles showing on the odometer. The Buy It-Now price is $3,200. The seller has excellent feedback ratings on eBay and he is obviously a very honest person. In his early ads (on Craigslist) he explained that the bike was imported piece by piece from India in 2003, and then assembled. It is registered as a 1955, he says. The seller dropped this long story from his later ads, but he piped right up with it when questioned on eBay. He took the bike in trade, he says, admitting he doesn't know much about the bike. What he may be overlooking is that buyers could be frightened off by the the motorcycle's provenience. Was it really ever one bike? Is the paperwork really in order? Whatever it is, it is not a 1955, as it is registered. Would there be a problem when the buyer wants to sell? Who knows? The seller could hide all this information easily, hoping to find a buyer who doesn't ask too many questions. To his credit, he hasn't hesitated to state the facts as he knows them. The seller says the bike has a clear 1955 Arizona title with matching numbers.